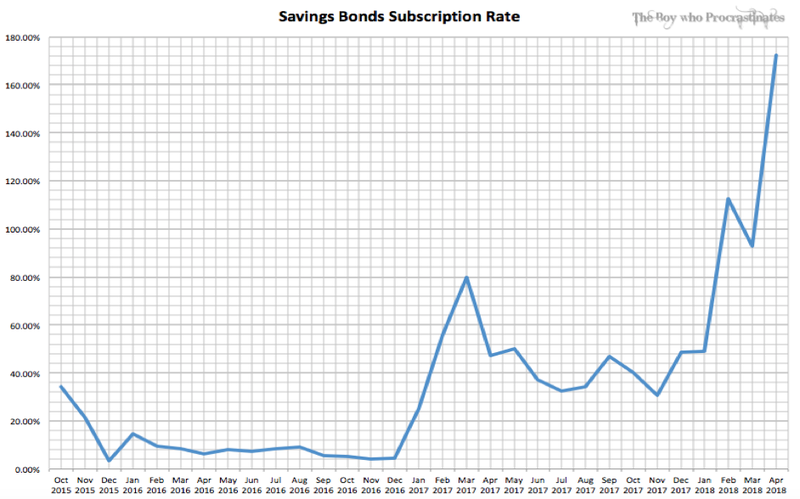 Today's topic which I am going to talk about is the Singapore Savings Bond ("SSB"). 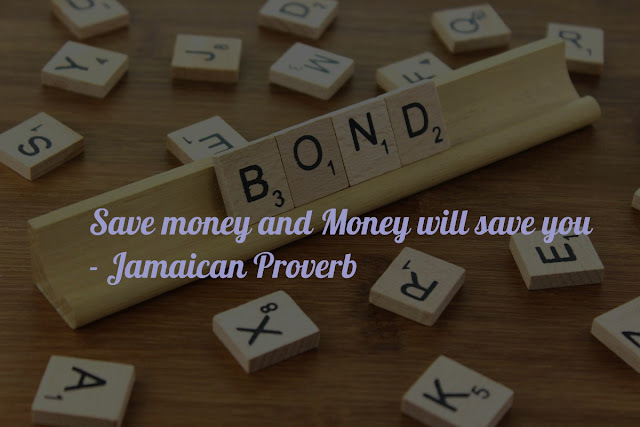 It is a type of government bond that is fully backed by the Singapore Government which makes it one of the safest instruments to invest in. There has been chatter around it due to the upcoming May issue which sees a historical high of 1.65% in its 1-year interest rate. But just how good is this current issue in terms of interest rate, as compared with the previous ones in SSB's history? As we now have more data collected since its first tranche launched in Oct 2015, we are able to analyse some of its trends and characteristics over the past 31 months. * For the sake of clarity, these refer to the average per annum rates. As shown in the chart, the interest rate has been on a downtrend since its inaugural issue. The lowest points occurred during the Sep 16 and Nov 16 issues. It climbs to a high in the Feb 17 issue and subsequently a rather sideways trend in 2017. The present shift that we are seeing is the rising short and short-to-mid term rates, which are at an all-time high in May 18 issue. SSB also appears to be issued with a narrower interest rate range over 10-years period since Sep 17. The interest rate for each SSB issue is based on the average Singapore Government Securities yields in the previous month. Interest is paid every 6 months and the interest increases over longer holding periods. The MAS has initially rolled out SSB with an issuance size of $1,200 million during its maiden Oct 15 issue. 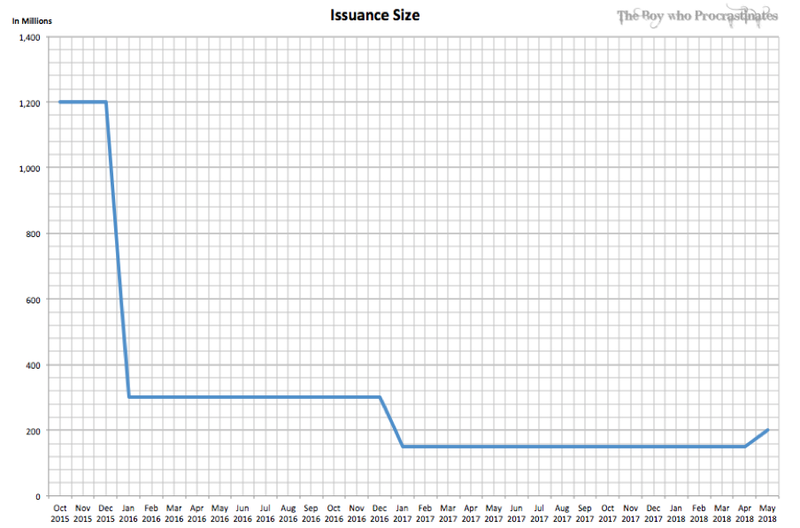 Subsequently, it has plummeted 75% to the issuance size of $300 million from Jan 16 issue onwards. This could likely be attributed to the significantly lower mid and long term interest rate which led to an abysmal subscription rate of just 3.42% for the Dec 15 issue. Thereafter, SSB has undergone another 50% drop in its issuance size to $150 million from Jan 17 issue. Likewise, it is probably associated with one of the lowest interest rate for Nov 16 issue, as manifested by the appallingly low subscription rate of 4.26%. It is only until this month that MAS has increased the monthly issuance size of SSB from $150 million to $200 million (33% increment) in response to the oversubscription for the two recent issues. Despite the steep decline in the issuance size since Jan 16, the take up for SSB has remained weak at less than 10% in 2016. The significant trend movement has only begun from 2017 which eventually tapered off from Apr 17. It is only until 2018 which we are able to see sharp surge in the take-up for SSB. From the chart, one may have noticed that the subscription rate has exceeded 100% in the Feb and Apr 18 issues, with the highest reaching 172% oversubscribed. In the event of oversubscription, the SSB will be allocated in denominations of $500 upwards for each applicant in each round. Correspondingly, the amount of SSB to be distributed will decrease by the quantity allocated in each round. The smaller applications will be filled first. If the remaining $500 is insufficient to fill all applications in the last round, then it will be randomly allotted among applicants. For applicants that were not fully allotted, they will receive a refund to the bank account. The amount of SSB that has been allocated in the last round is known as the quantity ceiling. To put it simply, if the quantity ceiling is $30,000, applicants who applied for $30,000 or lower will be given a full allocation (subjected to individual limit). Applicants who applied for $30,500 or above will receive either $30,000 or $30,500 on random basis. To put it into perspective, the quantity ceilings for the Feb and Apr 18 issues are $41,000 and $23,000 respectively. MAS has recently announced the removal of the $50,000 issue limit from 1 March 2018. The individual limit still remains at $100,000 which refers to the maximum amount of SSB applicants are allowed to own across all issues. It is in my opinion that the prior implementation of issue limit might have had limited efficacy as applicants are effectively subjected to 3 limits in various circumstances. In retrospect, it will be beneficial for applicants to subscribe to issues with higher interest rate given the ease of early redemption without penalty. However, oversubscription is likely to occur for such issues and the quantity ceiling will kick in as the primary issue cap despite a higher issue limit. On the flip side, the imposition of an issue limit would probably serve little purpose in the event of low subscription rate or issues with low interest rate. Of course, this argument is presented with hindsight bias given the challenging task to predict interest rates for future issues. The graph shows the percentage of SSB that has been redeemed in the first year. There are a few peaks in the issues of Jun 16, Nov 16, Aug 17 and Nov 17. Unsurprisingly, all these peaks correspond to lower interest rate as compared to that of the ensuing issues. 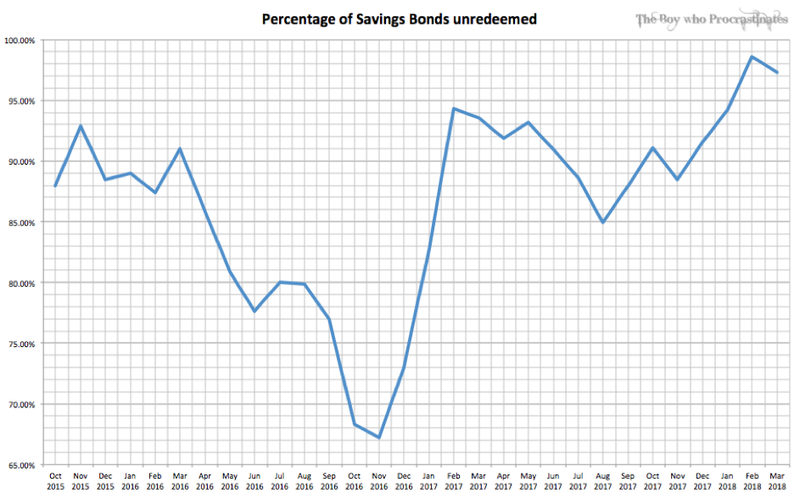 The percentage of SSB that has remained unredeemed has been maintained at an average of 86.52%. The statistic is averaged down largely by the data from 2Q to 4Q of 2016 in which interest rate has been on a downtrend. 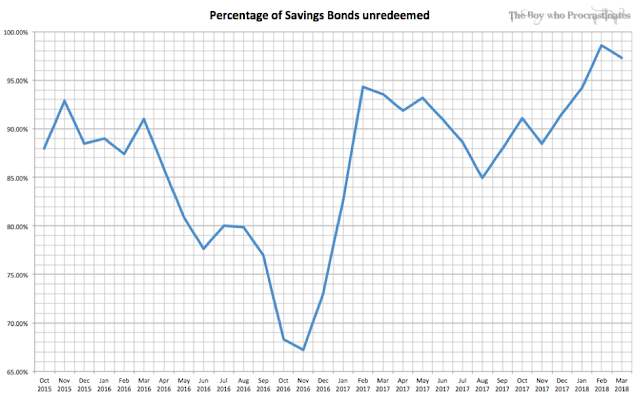 By and large, the overall percentage on the unredeemed SSB, especially that of the earliest issues, appears to align to the objective of SSB to provide Singaporeans a long-term savings option. 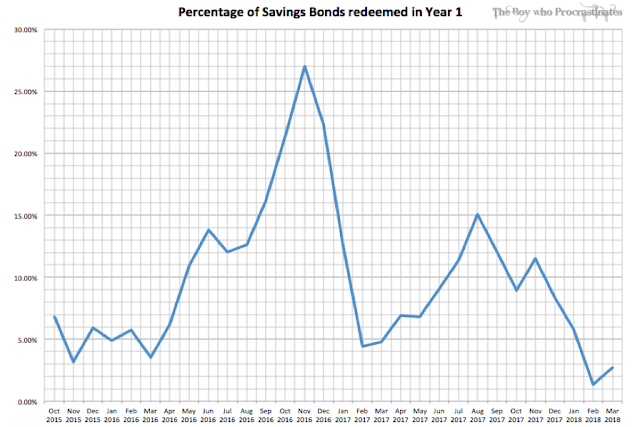 Investors have the option to fully/partially redeem the SSB in multiples of $500 in any month before the bond matures, with no penalty. It will take a month or less for the redemption proceeds to be credited back to your bank account. It is especially crucial to take note of the one-month notice period if investors are investing in SSB to maintain their emergency funds. If SSB is redeemed before the scheduled interest is paid, the investor will receive a pro-rated amount of interest payment. Coming back to the upcoming May issue, it has the highest short term rate of 1.65% and short-to-mid term rate of 1.91%. 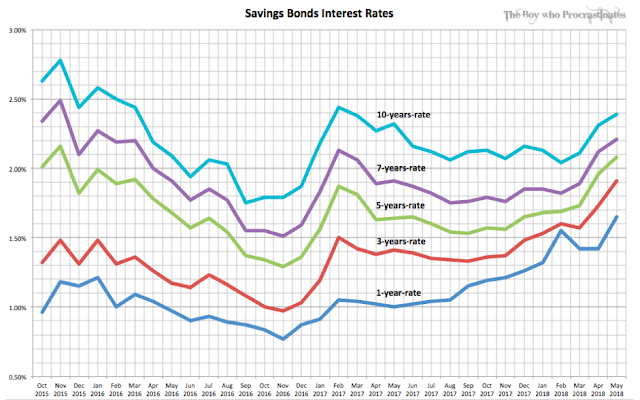 The mid and mid-to-long rates have also remained modest at 2.08% and 2.21% respectively. However, its long term rate of 2.39% is a far cry as compared to that of the earlier Nov 15 issue (2.78%). Given that the interest rate of the May issue surpasses that of the Feb and Apr issues which are both oversubscribed, there is a very high possibility that May issue will be oversubscribed as well. If we were to extrapolate from the past data, May issue is likely to be oversubscribed by at least 2x, with a quantity ceiling of $20,000 or below in spite of the 33% increase in the issuance size. For more information on the upcoming issue, you may wish to refer to the SSB website here. Active Savings Account: I have selected the BOC Smartsaver as the representative for this category. With a capital of $20,000, monthly salary crediting of $3,000 and monthly credit card spending of $500, the account offers an interest rate of 1.95% p.a.. Passive Savings Account: I have chosen the Citi Maxigain Savings Account for this group. Assuming the 1-month SIBOR rate stays constant at 1.31% and that the criteria for the counter mechanism has been fulfilled, the account offers an average interest rate of 1.65% p.a. for the first year. This is an interesting product which I will elaborate on in future. Fixed Deposit: One of the fixed deposits that currently offers the highest interest rate is the Sing Investment and Finance. Its promotional rate of 1.5% p.a. on 24-months SGD Time Deposit comes with a minimum deposit of $20,000. ABF Singapore Bond Index Fund: The ETF invests in the constituents of the iBoxx ABF Singapore Bond Index which tracks a basket of high-quality bonds issued primarily by the Singapore government and quasi-Singapore government entities. Based on its declared 2018 dividend of $0.0261 and the recent price of $1.123, the dividend yield is approximately 2.32%. Kindly note that this is excluding any capital gain/loss based on the price movement. 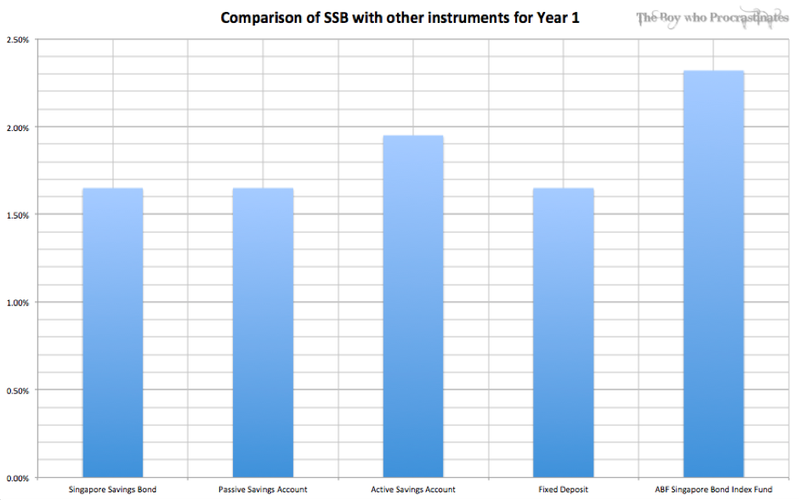 Graphically, the comparison of SSB with other instruments in the first year can be observed from the chart above. It is vital to note that the base interest of Citi Maxigain Savings Account (Passive Savings Account) may be subjected to the fluctuation in the 1 month SIBOR rate. Likewise, the returns on ABF Singapore Bond Index Fund may also be subjected to price fluctuation on the market. In the long run, the average interest rate p.a. of the May issue SSB will eventually reach 2.39% if held to the full maturity of 10 years. This might match the dividend yield of ABF Singapore Bond Index Fund without the exposure to price fluctuation on the market in the long run. Lastly, SSB should not be viewed as a standalone product and it would probably work best to invest in it as a complement to other financial instruments. Given the reasons provided above, The Boy who Procrastinates might consider subscribing a small sum for the upcoming issue. Disclaimer: Kindly note that this is not a sponsored post. The author is in no way affiliated with any of the parties mentioned and does not receive any form of remuneration for this post. The Boy who Procrastinates has compiled the information for his own reference, with the hope that it will benefit others as well. Thanks for sharing this info with us. Very useful and informative. Keep sharing such useful stuff. How Do You React When Your Companies' Share Price Goes Up or Down?